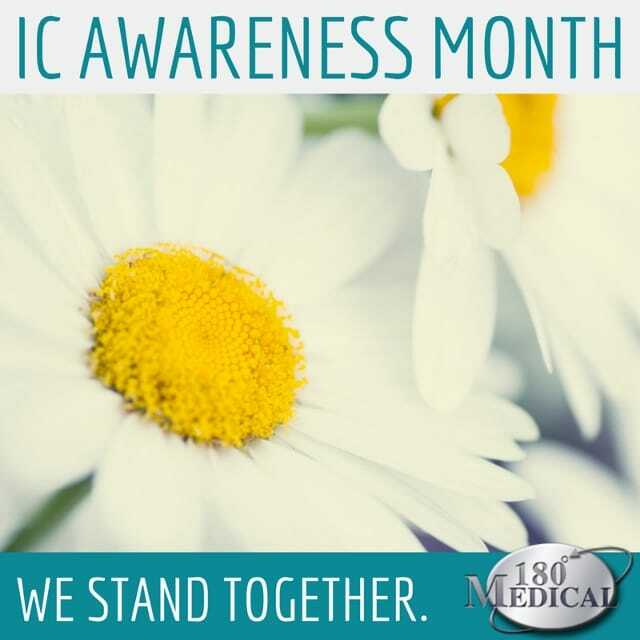 We here at 180 Medical want to do our part in raising awareness this month about a painful condition called Interstitial Cystitis. According to the Interstitial Cystitis Network, as many as one out of every 26 people in the USA right now may be living with symptoms of Interstitial Cystitis. But what is Interstitial Cystitis? And why is it important that we all do our part in raising awareness about this condition? Also known as Bladder Pain Syndrome (BPS), Interstitial Cystitis is a feeling that ranges from minor discomfort to great pain or pressure around the pelvic area, most specifically the bladder. It can happen to anyone, but it seems to be more prevalent in women. Many who are affected by the symptoms aren’t even aware that they have it. This is why it’s important to spread awareness, so that those who are affected can seek treatment. While there is no cure currently, there are a variety of treatments available that can help lessen the symptoms and make it much more manageable. If you have difficulty urinating, for instance, it may be as simple as starting a self-catheterization regimen. If you’re experiencing any of these symptoms, contact your doctor today. What Can I Do To Raise Awareness About Interstitial Cystitis? It’s easy to feel like you don’t have the power to raise much awareness. But if you use any form of social media (Facebook, Twitter, Pinterest, Instagram, or more), you have a great tool in your hands to share information and spread awareness. You can start out just by sharing a link to the IC Awareness Month official website at http://www.icawareness.org or sharing a link to this blog post from 180 Medical. Hand out flyers or hang a poster at your school, job, or local church. Talk to your doctor about putting up a poster or keeping brochures about Interstitial Cystitis available for patients and visitors to the office. Spread awareness by wearing your turquoise IC Awareness Ribbon or displaying it as a car magnet. Find yours at the ICN shop here. Remember, if you are living with Interstitial Cystitis, you’re not the only one. There are resources available to you for learning and connecting with a vast network of others who are dealing with symptoms like yours. Interstitial Cystitis Association (ICA) — Community dedicated to finding a cure and raising awareness. You can find support groups, online virtual education, tips and resources, advocacy options, and there’s an option to find a healthcare provider via their network. Interstitial Cystitis Awareness Month official website — Find out more ways to get involved with social media activism, see regular announcements and daily facts, and get access to videos and a media kit. IC (Interstitial Cystitis) Network Forums — Make friends and find support. IC (Interstitial Cystitis) Network — Access to resources and educational materials, read recent news and events, find a specialist in your area, and more. Do you know about the condition known as interstitial cystitis? Get more information here.